Buck Moth, Hemileuca maia/ nevadensis, a not so giant member of the Giant Silkworm family, Saturniidae. 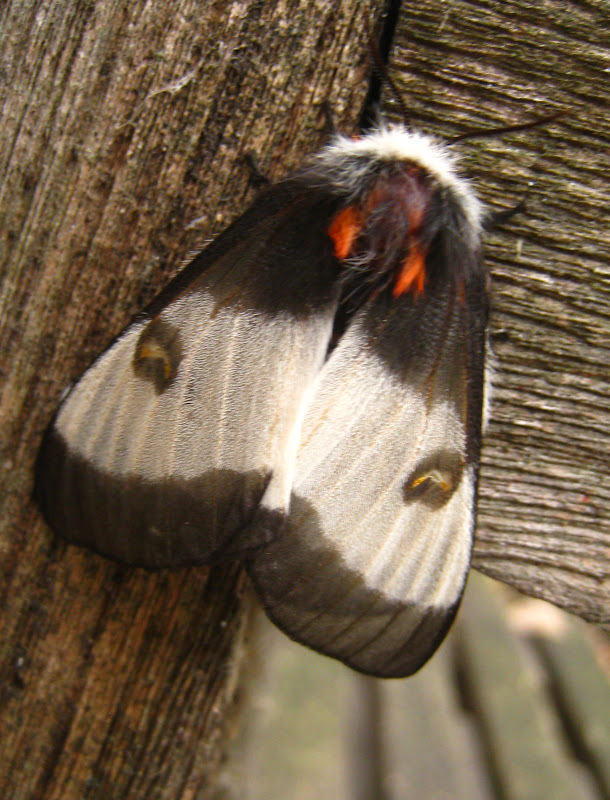 Besides the distinction of its striking appearance, the caterpillars of Buck Moths are covered with stinging hairs. H. maia and H. nevadensis are two very similar species whose ranges overlap in eastern MN. I wonder why it assumed this position? I saw it photographed this way somewhere else, but found no explanation in my brief researches. In an article from the Journal of the Lepidopterists Society it was mentioned as a defensive position, but I'm not clear how it would be defensive; maybe exposing the bright orange strips of the abdomen startles would be predators (and to be exact, the article was about the Bog Buck Moth, which may or may not be a separate species). Suppossedly it is called a Buck Moth because its emergence coincides with the rut of bucks. I don't think that's the case here in Minnesota, but perhaps further south, where it is more common.